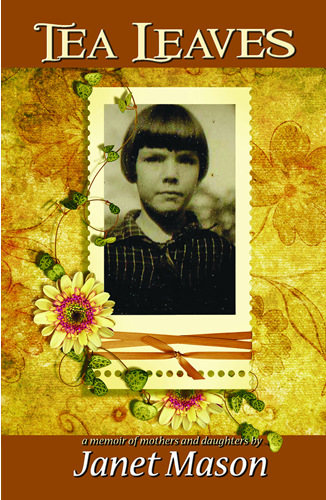 My memoir, Tea Leaves, was recently published by Bella Books. The book is about my life, my relationship with my mother, and how that deepened when I was taking care of her in the final stages of her life. My grandmother was a spinner in a textile mill in the Kensington section of Philadelphia and the book is layered with family stories — looking at love, the process of dying and of impending loss, and a look at how we are shaped by the relationship that formed us. Tea Leaves is a heartbreaking story of loss and at the same time a fierce and jubilant tribute. It reminds us of the way as daughters our accomplishments are always entangled in our mother’s disappointed dreams. As Janet Mason reveals the legacy of frustration, shame and rage that passed like an unspoken heirloom through generations of her working-class family, she also uncovers a stubborn, bright hope, and a keen sense of injustice, that are equally her inheritance. This vivid and moving memoir leaves us knowing that Mason’s dialogue with her mother will go on forever and will continue to transform her, in the way we are all continually in onversation – painful and liberating – with the past. I would like to use this blog to dialogue about the relationships of mothers and daughters, to talk about loss and the grieving process and how it shapes us, and to bring you the words of other writers who deal with similar themes.